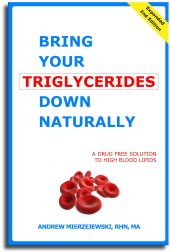 Bring Your Triglycerides Down Naturally: A How-To Guide - Full of Health Inc. I was so happy to be able to find this book. My God, I think I will go to my Doctor and ask him why he didn't explain to me why I have high triglycerides. I was wrong thinking it is too much of fat food only. Now I'm reading your book and I'm learning so much about it. Thank you for this great information. Now I know more why my cholesterol is 270 and triglycerides are 575. I'm so blessed to read your book and learn more about.